After years of percussion-related studies that were pursued on the college level with the intent of becoming a band director, Brady Muckelroy turned his attention to bass guitar. By fusing his previously-acquired percussion experience with the harmonic and melodic potential of alternately-tuned fretted and fretless electric basses, Muckelroy found his voice as a solo bassist. 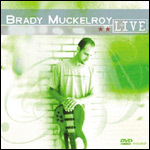 Since 2001, Muckelroy has released two recordings as a leader, Brady Muckelroy Live (2004) and Too Much Coffee (2001). As a soloist, Muckelroy has toured throughout the United States and has performed at bass events such as BassUp! and the Bozeman Bass Bash. 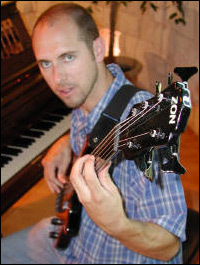 Currently a resident of San Marcos, Texas, Muckelroy teaches privately in addition to his live solo bass performances. In the following interview, Muckelroy discusses how his background as a percussionist has inspired his bass playing, his performance DVD, finding an audience as a solo bassist, and composing for solo bass. I began playing bass in 1998. I was sort of thrown into the whole thing. Some buddies of mine, at the church I was attending, wanted to put together a Wednesday night praise team/ worship band for the youth group. They had a drummer, guitarist/vocalist, and keyboardist but no bass player. In faith, they went to the pawn shop and bought a $75 beat up Hondo bass. I was bored, one evening, and went down to the church to listen to the guys rehearse. The bass was sitting there. I picked it up and put my ear to the body as to hear the pitches I was fumbling through. I was learning how the frets worked, and the guys saw me doing this. They quickly told me that I was going to play bass with them. Two days later, we had a gig. I played whole notes, but I got better soon after. I really began to enjoy the instrument. I played mostly in church for over a year. Bass was always on the side, though. I was so busy with all of my percussion-related pursuits because I was a percussion major at Texas State University in San Marcos, Texas where I was majoring in music education. I was lucky enough to have been in the Texas state drumline for four years, section leader for two of those years, and even taught the line for the following two years. I have marched with two top 12 drum corps including The Blue Knights of Denver, Colorado in 1996, and the Madison Scouts of Madison, Wisconsin in 2000. 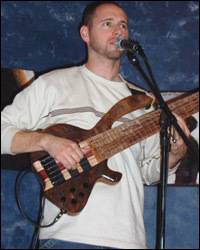 It wasn't until the fall of 2000 that I began exploring the bass guitar as a solo instrument. After years of studying percussion as a music major in college, why did you decide to pursue electric bass instead of becoming a band director? Five years into college, I began to experience some burnout. I was really getting tired of playing marimba etudes for a grade. After returning from my tour with the Madison Scouts, I had an overwhelming desire to play the bass. I would spend hours and hours on the thing. There was something unique in bass playing, for me, in the sense that it was a joy rather that a chore. I knew that I was still in my infancy as a player, but there was a constant glimmer of hope that something good was on the way. I saw the complete opposite in band directing. I decided to run, full-force, after this passion. I soon began to discover my voice in the electric bass. Has your background in percussion affected your approach to playing bass? Indeed! From a solo standpoint, I have a lot of ground to cover. I basically try to cover all of the essentials of an ensemble from one instrument including percussion, bass, chords, melody, and even harmony. Having a strong sense of percussive fortitude just helps things groove a little better. I like to apply techniques from percussion to the fretboard. I even use rudiments which is tons of fun. In a band setting, I play bass like I would play drums. This really helps me lock with a drummer. The same holds true in my drumming. I play drums like I would play bass. This helps a bassist lock with me. I do still play drums and percussion but just not as much. Which bassists have influenced your playing? The first solo bassist to influence me was Trip Wamsley. I consider him the sparking influence. Other influential players include Michael Manring, Flea, Jaco Pastorius, John Patitucci, Victor Wooten, Keith Horne, Nathan East, Nelson Braxton, Mark King, Will Landon, Seth Horan, Adam Nitti, Norm Stockton, and Sting. One of the non-bass-playing influences that also really inspired me was Michael Hedges. There are many more, but then again, it's probably safe to say that almost everything I come in contact with influences me one way or another. I would say that life is a big influence on my music. To someone who has never heard you play, how would you describe your music? This one's tough! It stumps me every time. To tell someone it's solo bass music would only confuse them. I usually mention the genres I cover such as smooth jazz, funk, r&b, folk, neo classical, atmospheric, and a little pop. My usual response is you'll just have to hear it for yourself. Can you tell us about your latest DVD/CD project? Brady Muckelroy Live was recorded at the Promiseland Church in Austin, Texas in 2003. It was finished and edited about a year later. My production team manager was Billy Stull. He originally mastered my first recording, Too Much Coffee. He approached me later about putting together the DVD project in the hope of promoting me. We looked over some contracts with his business partner and I agreed. The time of our contract has come and gone, and nothing in the way of a record label has happened but that's ok. The project has been very useful because people can actually see and hear me play on the DVD. Half of the show is visual. I must say that it's neat having a DVD! It turned out very nice. We only pressed 1000 copies, and there are still some left. I don't think it will be re-pressed, though. In the meantime, I'm pressing on. Is there an audience for solo bass music? There is an audience for solo bass music. However, it is pretty small. What I've done is try to carve out my own niche. If people, who know nothing about solo bass, happen to be at a show of mine, they stick around and end up really enjoying it. I've played in situations were there is a built-in audience such as a band's following, and I'm the opening act so those unsuspecting audience members get exposed to solo bass. Most of the time, they like it. Word of mouth travels, and good things happen. It is a challenge getting gigs in the typical music venues such as bars and clubs. Solo bass is more of a listening-audience-oriented show. I perform in a lot of coffee shops. As far as making a living with the solo thing, I've not found a way yet. Most of my band gigs are the working gigs which mean they pay considerably more. There are solo bassists who do quite well, but I don't know of any who only play solo. Most solo bassists that I know do gig some with groups. I look at it this way. I do the work gigs so that I can afford to do my art. How do you approach composing for solo bass? I don't have one single set way of composing. The first seven tunes I composed just happened. It was a matter of spending enough finger-flopping time until I happened upon something. I'm much more critical now. I strive to make music happen versus chops. Speed and technical chops are great, but five minutes or more of playing weed-eater will lose an audience. When I hear something in my head such as a melody, chord progression, or even a rhythm, I sing it out loud. If it sticks, I'll pick up the bass and play the part I'm hearing. It's a matter of going where it takes me. Some of my tunes are based on a theme. Others utilize a specific technique to create the vibe. All in all, it starts in my heart then I think about it as it finally makes its way to my hands. Some are immediate and others take months. Looping has also been another aspect of my composition. It really changed the way I deliver a tune. Looping, in itself, is a whole other ballgame. It has added a good deal of variety to my live show. Do you employ altered tunings in your solo compositions? Yes I do. Altered tunings change the way I play the instrument. It's neat because I use an altered tuning, and it's like playing a different instrument that's strung just for the specific song being played. I think the audience picks up on the tonal difference as well. They might not get it or understand what I did to make the bass sound that way, but it has shown to be a good thing for the most part. Please keep in mind when I refer to the audience that I'm not necessarily referring to other bassists or musicians but rather more so the general public and non-musicians who like music. Besides performing as a solo bassist, do you play any regular band-related gigs? I do perform in bands. I'm currently playing in The Jack Burton Trio (acoustic drivin' funk), Soundwave (British rock/christian), The Jon Barry Project (smooth jazz), The Paul Eason Band (Texas country), The Austin Metro Praise Team, and the worship team at the Connection Church in Kyle, Texas. Besides those groups, I take on various side projects and do session work when the phone rings. I hope to put together and front a trio or quartet soon. Do you prefer playing more as a soloist or a role as a supportive player from within the context of a group? I like to maintain a healthy balance of both. That consists of about one solo show to every two or three band shows and sometimes it's dead even. Where can viewers purchase your music? For the time being, it is limited to being available at my live shows. I can sell and ship a CD to anyone if they e-mail me with their information. There are a few small local businesses in San Marcos that have my music for sale, too. Hopefully, this will change soon. I plan to record another solo bass project. I'll be putting together and fronting a trio or quartet with an emphasis on being bass-driven and solo playing in an ensemble setting. Be on the lookout for GK clinics and new sounds on my Bee bass!